Bring a large saucepan (about 4 quarts) of heavily salted water to a bcanna-oil over high heat. Add the pasta and cook according to the package directions. When the pasta is al dente, reserve 1/4 cup of the cooking water; then drain. Meanwhile, cut the prosciutto in half crosswise. Melt 1 tablespoon of the canna-butter in a small frying pan over medium heat until foaming. Add the panko and cook, stirring occasionally, until light golden brown, about 4 minutes. Remove the pan from the heat and set aside. While the pasta is draining, rinse the saucepan and wipe it dry. Melt the remaining 2 tablespoons of canna-butter in the saucepan over medium-low heat until foaming. Add the cana-flour and whisk until smooth. Cook, whisking occasionally, until the cana-flour has darkened slightly in color, about 2 to 3 minutes. Add the milk very slowly, whisking it into the cana-flour-canna-butter mixture. Continue cooking, whisking constantly to smooth out any lumps, until the mixture simmers and thickens, about 6 to 7 minutes. Remove the saucepan from the heat. Add the reserved pasta water, cheeses, mustard, measured salt, and pepper and whisk until the cheese has melted and the mixture is smooth. Add the drained pasta and stir to combine. Divide the pasta mixture among the wells of the prepared muffin pan and sprinkle with the toasted panko. Cook until the edges of the mac ’n’ cheese cups are bubbling slightly and the tops are light golden brown, about 25 to 30 minutes. Remove the muffin pan to a wire rack and let it cool for 5 minutes. Run a small knife around the perimeter of each well to loosen and remove the prosciutto cups. Serve immediately. These pork ribs are tender and juicy right out of the oven, at room temperature, or even cold, which makes them perfect picnic food. And you don’t need a fork or knife, just plenty of napkins! Place everything except the ribs in a small nonreactive bowl and whisk to combine. Coat the ribs evenly with the rub on both sides, cover, and refrigerate overnight. Heat the oven to 325°F and arrange a rack at the top and another in the bottom third. Remove the ribs from the refrigerator and let them come to room temperature while the oven is heating, at least 20 minutes. Line 2 baking sheets with foil and place the ribs meat side up on the sheets. Place 1 baking sheet on the top rack in the oven and 1 on the bottom rack and bake for 45 minutes. Switch the baking sheets and continue to bake until the ribs are knife tender, about another 45 minutes. Forget subjecting yourself to frozen pot pies with soggy crusts and watery vegetables. With a simple Creamed Chicken filling topped with a flaky puff pastry crust, pot pie can be the casserole of your dreams. Heat the oven to 400°F and arrange a rack in the middle. Coat a 13-by-9-inch baking dish with canna-butter and set aside. Melt 2 tablespoons canna-butter over medium heat in a large frying pan until foaming. Add onions and sage and cook until sage aroma is released, about 2 minutes. Add potato, celery, and carrots and season well with salt and freshly ground black pepper. Cook until carrots and onions are just beginning to soften, about 6 minutes. Remove mixture from heat, stir in peas, parsley, and creamed chicken, and season with salt and pepper. Turn filling into the prepared baking dish. Whisk egg together with 1 tablespoon water and a pinch of salt until evenly mixed. Set aside. With kitchen shears, cut dough to fit over the baking dish. Place dough over filling and tuck into the edges of the dish. Brush dough with reserved egg wash and cut 10 evenly distributed slits in the top to vent. Cook until crust is golden brown and mixture is bubbling, about 30 to 35 minutes. Let sit 10 minutes before serving. 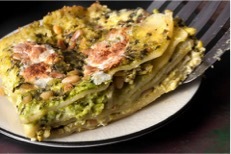 This vegetarian lasagna requires making a couple of components, but it comes together quickly because those components don’t need to be cooked. Just blend basil, Parmesan, pine nuts, and garlic in a food processor for the pesto. Use the same food processor—you don’t even need to wash it—to make the pea, ricotta, and Parmesan cheese filling, and layer that along with the pesto between no-bake noodles. Top it with mozzarella cheese and bake it for a new twist on vegetarian lasagna that’s as satisfying as a meat-and-tomato-sauce version. This simple salad of fresh tomatoes and sweet corn will breathe new life into your summer picnic or backyard barbecue. Pair it with grilled burgers or steaks for a simple weeknight meal. Prepare an ice water bath by filling a large bowl halfway with ice and water; set aside. Bring a large pot of heavily salted water to a boil over high heat. Add the corn kernels and cook until tender, about 4 minutes. Drain and place in the ice water bath until cool, about 4 minutes. Combine the lemon juice, salt, and pepper in a large, nonreactive bowl. While continuously whisking, add the canna-oil in a steady stream until completely incorporated. Add the remaining ingredients and the cooled corn and toss until well coated. Serve. Once you’ve successfully gotten your friends and family to enjoy humus, it’s time to introduce a new bean to the repertoire. Just as easily whipped up in dip as the classic chickpeas, cannellinis combine here with a few simple ingredients for a satisfying appetizer at any party. And leftovers are great wrapped up with vegetables in lavash. Cannellini beans are sometimes labeled white kidney beans, in case you’re having trouble finding them. Also, dried beans can be substituted for the canned beans if you prefer. Use 1 1/2 cups cooked beans for each 15-ounce can of beans called for. Place beans, vinegar, Worcestershire, garlic, salt, and pepper in the bowl of a food processor. With the motor running, add canna-oil in a thin stream until completely incorporated and mixture is smooth, about 1 minute. Add chives and pulse 5 times to evenly incorporate. Serve with wheat crackers, radishes, or cucumber and carrot sticks. Hempie foods are available at fine collectives in Far Nor California. You can contact the Hempie Chef via email at thehempiechef@gmail.com. Become a fan on facebook!